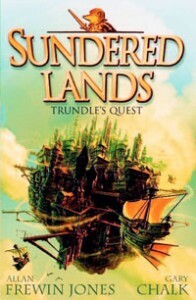 Trundle Boldoak isn’t looking for adventure; he rather likes his quiet little life as town Lamplighter on the cabbage-growing island of Shiverstones. 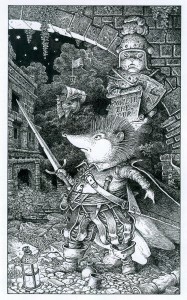 But although he hankers for nothing more energetic at day’s end than a bowl of cabbage broth and an evening with his snout in a good book, a stupendous adventure decides to come looking for him! Esmeralda Lightfoot, a Princess of the mysterious Roamany folk, knows he is the one to help her find the six lost Crowns of the Badger Lords of Old, which were long ago scattered and hidden throughout the Sundered Lands. This has been revealed to her in a reading of the ancient and magical Badger Blocks. 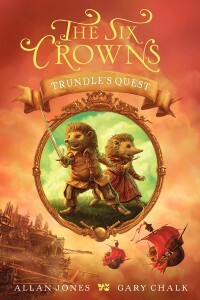 Before Trundle can finish his cabbage tea, the two of them are off in a windship bound for strange and distant worlds - but their quest is not without its perils. Hot on their heels and desperate to find the Crowns for their own nefarious purposes are the fearsome Captain Grizzletusk and his bloodthirsty pirate crew!